I discovered the most disturbing thing last weekend. There are people who (brace yourself…this is earth shattering news) don’t like cake. Seriously? I thought my crazy husband was the only genetically deficient (and I mean that in the nicest way possible) one. But apparently, there are more of you out there. One of them is my sister Elizabeth. Yes, the Lizzy of cowboy salsa and pirate’s punch doesn’t like cake. It is just so depressing. She does like pie though. Pumpkin pie specifically. So for her birthday last weekend I made plans to cook up some pumpkin-y fall deliciousness. No, you are not crazy. That is absolutely not a photo of a pumpkin pie. Wanna know why? Well, you’re in luck, cause I’m in a sharing type mood. My dreams of orange custardy goodness were dashed when I was told that Elizabeth doesn’t like homemade pumpkin pie. No. She likes the cheap, tiny, (crappy and disgusting) Safeway pumpkin pies. The ones they sell all year long that are about 5 inches wide. That’s right. Not allowed to make a cake and have to BUY a pie instead of creating a homemade masterpiece. Ugh. I had to do something. This would not do. I saw this recipe for pudding cake cookies over at Chef In Training and decided they were too fun and full of birthday cake cheer not to make them. 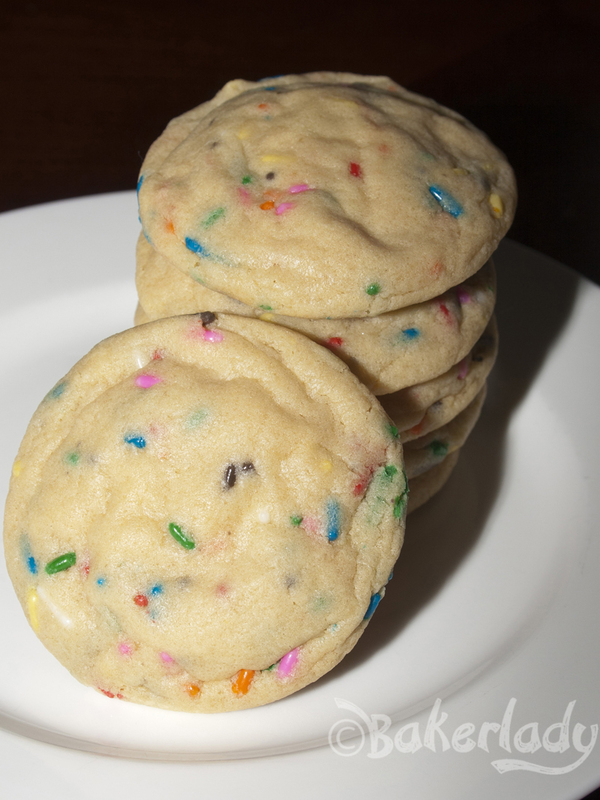 The pudding in the batter makes these cookies incredibly soft. Like pillows of cakey gloriousness. And the flavor is just like cake batter. Exactly. It is amazing. Rich, sweet and totally addictive. The entire tray of these was absolutely devoured. Even those who supposedly don’t like cake LOVED these. You want to use the small box of instant pudding. Click over to Chef In Training for a photo of what you’re looking for. I used white cake mix because I didn’t have any yellow and they turned out perfectly. 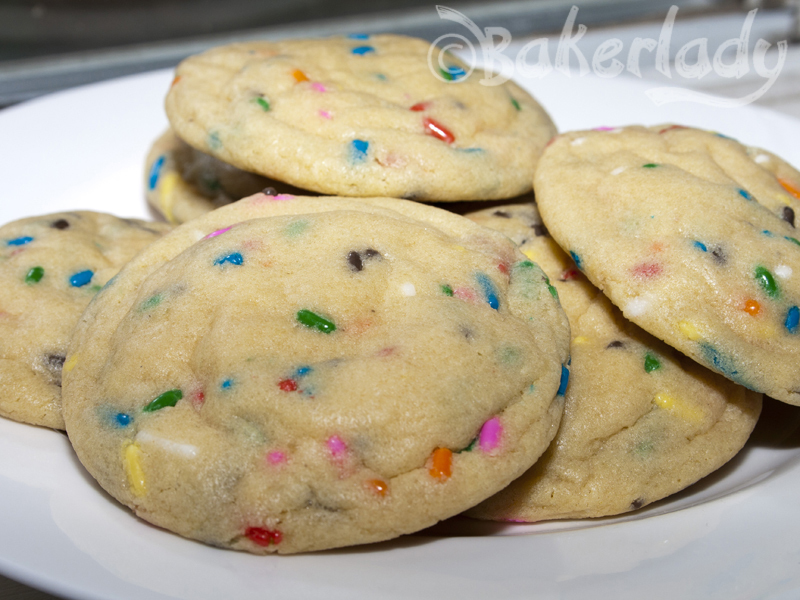 You could probably even use funfetti, but I like adding my own sprinkles. It’s just plain fun! Enjoy! Roll into 1″ balls and place on greased (or parchment paper lined) baking sheet. They look fun and pretty! It makes about 2 1/2 dozen. How much you whip the butter can have a big effect on the finished cookie. Also butter temp can change it quite a lot. Do you think I need to whip it for longer? Also use room temperature butter? Room temp butter for sure! Anyone ever tried to use a cookie cutter with these? or do they spread too much? The spread quite a lot. Don’t think they’d work as a cutter cookie. Sorry for the late reply. Yes, I think these would freeze just fine. 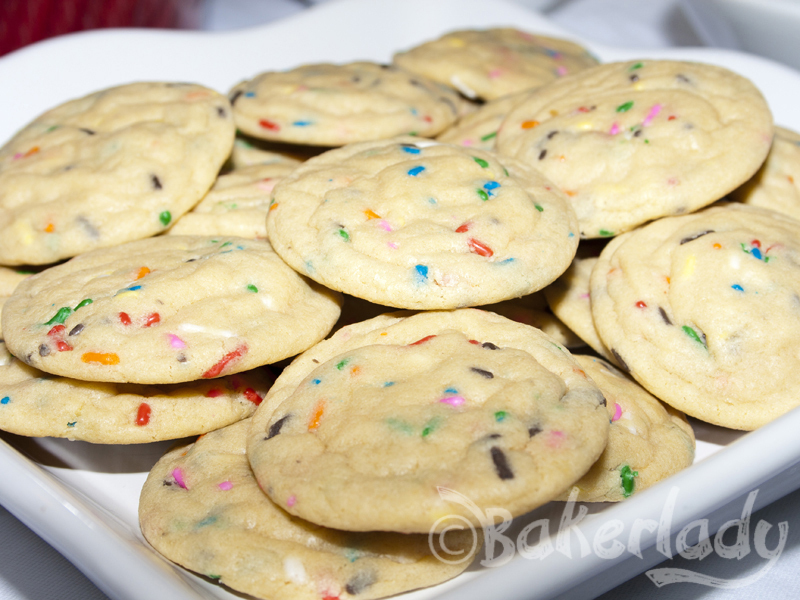 These are the best cookies I have ever made, so soft and delicious – my husband and 3 year old son request them to be made all the time! Thank you so much for a great recipe! Do you think you could use cookie cutters on them, or should they only be rolled out into balls? Thanks. This dough is not firm enough for cookie cutter/rolled cookies. Just balls. 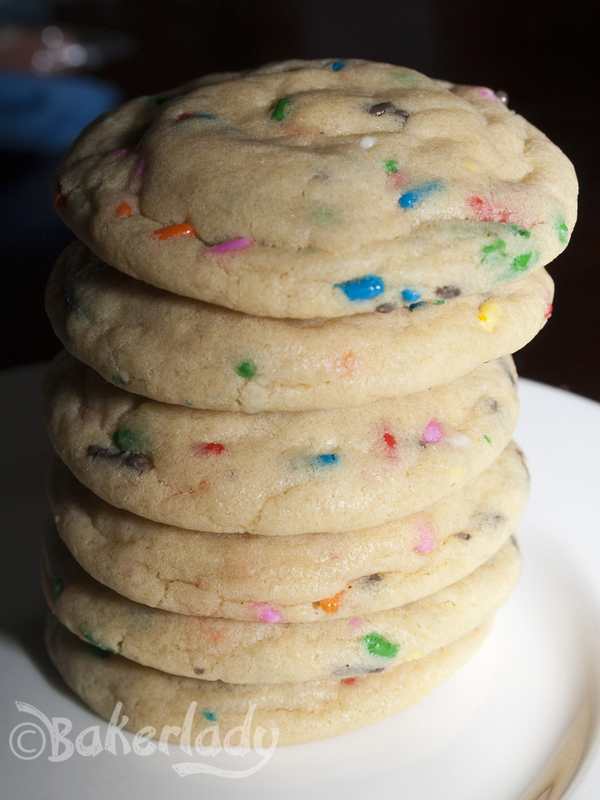 Could I make a few large cookies (like a cookie cake) with this or would individual? You never really know how a recipe is going to respond to being made in a large piece instead of smaller ones…until you try it. I haven’t tried that, so I can’t really tell you if it will work or not. Good luck! So, I LOVE these cookies. I like to roll them into a log and stand them upright so they bake to be fluffier and puffier. They’re really addictive (so much that I’ve dubbed them “crack cookies”), really easy to make (I’ve made them running sleep deprived and very late at night), and I find they travel extremely well (toss them in a container and/or a bag, and they’re still intact! ), and you are likely to have most of the ingredients. These are now my go-to cookies. But, I have to ask if you know how long they keep? I was planning on mailing these from Canada to a friend in the States, but they never seem to last long enough for me to find out how long it takes for these cookies to pass their prime. I have the same problem. They never last more than a few hours in my house! Just an FYI boxed cake mixes almost ALL contain partially hydrogenated oils aka Trans Fats! The bodies of little ones (and adults!) cannot process these synthetic ingredients. I would think twice about using the boxed mix or the jello pudding which also contain BHA, an ingredient banned in most other countries. Ahh, boo. There’s always ONE. Would these be safe for someone with peanut allergies? Be sure to double check the cake mix ingredients to ensure they don’t have any peanut allergy issues. Would gluten free cake mix work for these? My grandson has celiac but he is my little Cookie Monster. I see no reason it wouldn’t. Texture might change slightly (as is common with GF stuff), but I’ll bet it would work.